Dr. Angela Spurgeon is a board eligible Neurosurgeon affiliated with CoxHealth in Springfield, Missouri. Dr. Spurgeon is a native of Owensville, Missouri. She was awarded the Winston Churchill Academic Scholarship and attended Westminster College in Fulton, Missouri. Dr. Spurgeon was a member of the Tri Beta National Biological Honor Society and co-captain of the Westminster women’s volleyball team. After completing her undergraduate degree in 2004, Dr. Spurgeon went on to earn her medical degree from the Kansas City University of Medicine and Biosciences in 2009. Following medical school, Dr. Spurgeon completed a 7-year Neurological Surgery Residency at the University of Missouri in Columbia. Dr. Spurgeon’s passion for the treatment of cancer patients lead to an additional year of training to focus on the surgical management of brain and spine tumors. 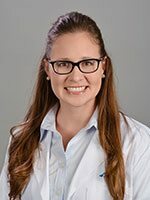 In 2017 she completed a one-year fellowship in Neurosurgical Oncology at the H. Lee Moffitt Cancer Center and Research Institute in Tampa, Florida. In 2017, Dr. Spurgeon joined Springfield Neurological & Spine Institute. At SNSI, Dr. Spurgeon practices as a general neurosurgeon, with special clinical interests in tumors of the brain and spine. More specifically these interests include the awake resection of brain tumors adjacent to critical speech and movement areas, image-guided stereotactic techniques for brain tumor resection, endoscopic resection of pituitary tumors, radiofrequency ablation of spinal metastases, resection of spinal tumors, and stereotactic radiosurgery. Outside of medicine, Dr. Spurgeon enjoys spending time with her family and a variety of outdoor activities especially horseback riding, camping, and grilling.